Looked at as a tourist haven in the winter months, the islands found within the Caribbean, are just as lively in the winter as they are in the summer. And no wonder either! The festivities that surround the months of December-February are events not to be missed. Check out a few favourites that are worth considering during your upcoming winter holiday. Usually on the second Thursday in December, the Junior Junkanoo Parade highlights the talents of the next generation of Junkanoo dancers. Children learn the Junkanoo dance when they are just toddlers, so be prepared to be amazed! 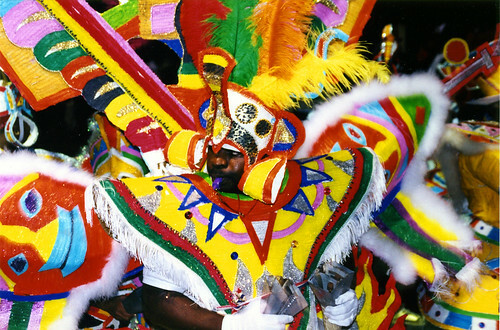 When Dec. 26 comes around it is the biggest (non-religious) festival day in the Bahamas, because that’s when the Boxing Day Junkanoo parades take place across the islands of the Bahamas. The parades start at 2am, just after midnight Christmas Mass concludes and the celebration of Christ’s birth gives way to overtly joyous celebrations – this is not your typical Christmas hols! St Kitts National Carnival is much like a national pride day type of festival but what makes this festival stand out is the fact it overlaps with major holidays like Christmas and New Year’s. From about mid-December to January 2nd there is a great mix of both holiday festivities and those celebrating national pride. Highlights include pageants, j’ouvert music, food fairs, and plenty of street parties. Skip the local fireworks and head for St Kitts. Also known as El Reyes, this is a huge celebration in Puerto Rico. The holiday is very similar to Christmas and because this celebration is in January you will find people celebrating the winter holidays much longer on this island. Besides the big feast, to celebrate this holiday children place grass strands inside a box for the camels to eat and good children will be rewarded by the kings (aka Los Reyes) with gifts. If you are in Puerto Rico in January, try to catch up with the Three Kings from the town of Juana Diaz, who tour the island before heading back to the Holy Land. Since 1964 Grenada has been hosting this worldwide fishing event. Whether you come to participate or spectate, it is incredible to be a part of if you enjoy fishing. The tournament includes a boat parade and dinner, with prizes for top boats and heaviest fish (including Blue Marlin, White Marlin, Sailfish, Yellowfin Tuna, Wahoo, and Dolphin). Just about each of the Caribbean Islands hosts a carnival celebration that is unique in its own way, but Aruba‘s exhibits both Dutch influences and the culture of the Antilles which makes it even more special to attend. The carnival features parades in San Nicolas and Orenjestad highlighted by calypso music, a balloon parade, the crowning of a Carnival king and queen, a Heineken drinking contest (have you been practising? ), and the burning of King Momo. Definitely worth checking out if you’re in Aruba during the month of January. The Three Kings Festival is a very big deal here in Puerto Rico but I would say it is more of a family day though there ate parades in some towns like Andrew mentions. For more of a carnival atmosphere you should check out the San Sebastián Street Festival in Old San Juan, also in January. It’s San Juan’s version of Mardi Gras / Nottinghill Carnival. Well worth arranging your trip around it.